On July 23, 2018, one of the Saddle Dams of the Xe Pian Xe Nam Noy Hydropower Project—the largest dam ever to be constructed in southern Laos—broke, sending up to five million cubic meters of water gushing into the Xe Pian River Basin and very rapidly inundating 13 villages, with six of those being totally destroyed. The human death toll from the disaster is 43, with another 28 people still missing. Over 7,000 people are facing long-term displacement. The event also caused serious flooding in downstream parts of northeastern Cambodia. This catastrophic human-caused disaster attracted considerable international media attention, and also deeply affected the views of many Lao people, who have begun questioning, like never before, Laos’ plans to become the “battery of Asia”. However, what about the slow violence that the same dam was already inflicting on people and the environment even before it broke? Why have those impacts received so little attention, even after the Xe Pian Xe Nam Noy Dam became the focus of international media? 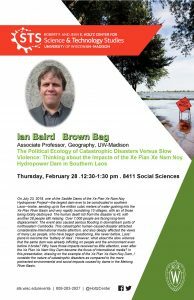 In this presentation, drawing on the example of the Xe Pian Xe Nam Noy Dam, I consider the nature of catastrophic disasters as compared to the more protracted environmental and social impacts caused by dams in the Mekong River Basin.